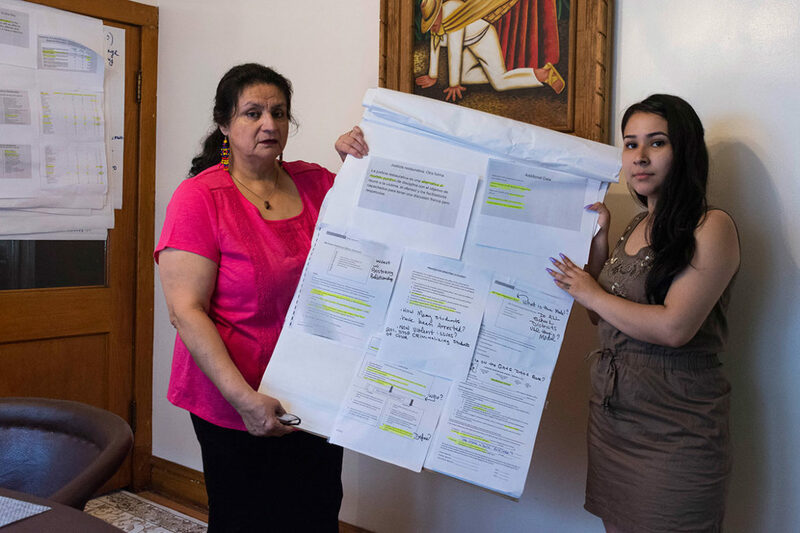 Delia Barajas and Elizabeth Morales, members of the community group Ixchel, hold materials they’ve used to educate Cicero and Berwyn residents about school discipline and racial disparities. Last summer, several women gathered at Delia Barajas’ home. As part of the community group Ixchel, they tackle education issues like school discipline in the mostly Hispanic communities of Cicero and Berwyn. Under a 2014 law, the state must publish data every year about how students are disciplined in school. Officials are supposed to include a breakdown by student race and ethnicity and indicate which behaviors triggered suspensions and expulsions. Advocates say it’s important that school communities have access to this information because research has long shown that black students are disciplined more often and more severely than their classmates. And it’s often more subjective, non-violent behaviors — when students are labeled “defiant” or “disrespectful” — that drive discipline disparities. But the state is concealing the race and ethnicity of students who are suspended and expelled from most school districts. Here’s why. Why is the state redacting data? State officials say they have to redact race and ethnicity data to comply with federal and state requirements about protecting student privacy. They’ve decided that to do that, they won’t reveal any student groups that are smaller than 10 — a common practice in government reports. But Illinois officials say they also have to remove data on student groups much larger than 10 to protect the identity of students in smaller groups. As a result, few school districts have any race or ethnicity data. Here’s how that looks in practice: Say a school district gave out 309 suspensions and 100 went to black children, 100 went to Hispanic children, 100 went to white children and nine went to multiracial children. State officials have redacted all of the race and ethnicity data in their reports to protect the nine multiracial students. They say a “reasonable person” could look at the total, do the math and identify individual students. Those who advocated for the 2014 data law say the state is undermining larger school discipline reform efforts by removing key data from its public reports that would allow members of the public to spot possible racial discrimination, track progress and hold school officials accountable. Individual school districts don’t always make this information public. The federal government publishes similar data, but it’s two or three years old by the time it’s released. As a result, school officials can claim they’ve made changes, or shouldn’t be judged by the old numbers if there’s a new administration. In Chicago, for example, there’s been four CEOs in just three years. Is there any way to get unredacted data? The Chicago Reporter filed an open records request last year to obtain the unredacted race and ethnicity data. The Illinois State Board of Education denied this request, citing student privacy concerns. The state’s attorney general’s office agreed ISBE could redact the data. Click here to see how often your school district suspends and expels black, white, and Hispanic students. But a Loyola University Chicago clinical law professor, Miranda Johnson, together with a team of graduate students, managed to pry loose some of the state’s discipline data for black, white and Hispanic students. Johnson provided this data to The Chicago Reporter. This data offers a better picture of school discipline in hundreds of districts across the state. For example, let’s look at the most recent data for Rockford Public Schools. It’s Illinois’ fifth-largest school district with more than 28,000 students. The state’s public report indicates only that Rockford suspended students from school 6,575 times in the 2016-17 school year. All race and ethnicity data has been redacted. Loyola’s data, paired with district demographic data, show that black students were suspended much more often than white students. Are the redactions necessary to protect student privacy? An attorney for the Illinois State Board of Education says the agency’s redaction policy “reflects best and standard practices.” But legal experts say Illinois’ precautions exceed those taken by other states and the federal government. The U.S. Department of Education reveals student groups that are smaller than 10. It reports rounded values with a de-identification technique known as “blurring.” But Illinois officials chose not to do this. Some parents and community groups have filed public records requests with their local districts or contacted lawyers to get better school discipline data. Ixchel, for example, held an educational forum in Cicero last fall with the Chicago Lawyers’ Committee for Civil Rights. An attorney from that group provided parents with more detailed discipline data that the organization obtained through the state’s Freedom of Information Act. After seeing that, many parents expressed concern. “That’s what we wanted to do… to make sure there is awareness because the school district isn’t relaying this to students, parents and the communities,” Ixchel’s Barajas said. Are changes on the horizon? After the redacted reports appeared on the state’s website, State Sen. Kimberly Lightford and advocacy groups told state officials about their concerns. But nothing changed. So Lightford introduced a bill earlier this year that would require Illinois to use the federal government’s disclosure method, which would result in the publication of more race and ethnicity data. The state would also be required to report more data about behaviors that trigger suspensions and expulsions. That would include crucial categories that drive disparities, such as disruption, disrespect and defiance of authority, dress code violations and being late or cutting class. Right now, all of those reasons are lumped together in the “other reason” category. State officials say they have concerns about the bill, but declined to elaborate. “ISBE believes we need to maintain strong protections for students’ privacy,” spokeswoman Megan Griffin wrote in an email. The Illinois Principals Association opposes the bill. The advocacy group says it’s too soon to change how discipline data is collected and published. The bill hasn’t made it out of committee; advocates say it’s unlikely to be taken up before the fall. Kalyn is a reporter for The Chicago Reporter. Email her at kbelsha@chicagoreporter.com and follow her on Twitter @kalynbelsha. National Teachers Academy parents argue that Chicago’s plan is discriminatory towards the top-ranked South Loop school’s mostly low-income and African-American students. Ambiguous state law means the voting rights of inmates varies widely between jails, disproportionately affecting poor blacks and Latinos awaiting trial in Illinois. Here’s a roundup of how the Trump administration’s stated policy goals would interact with local laws on immigrant and religious protections, healthcare, housing, education and law enforcement.